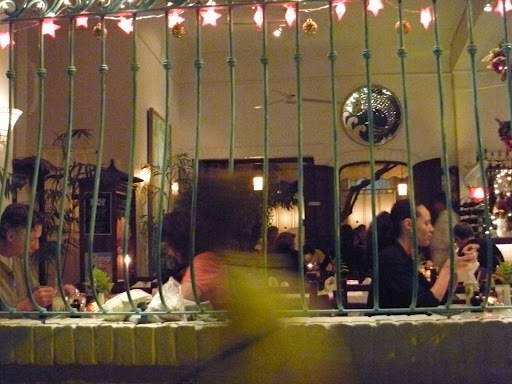 Archie’s Wok is a classic Puerto Vallarta restaurant that was opened in 1986 by John Houston’s Private chef (Archie) and is still owned and run by his family. Archie’s Wok serves a diverse selection of Asian inspired dishes, from a Cambodian Beef curry to pad Thai made with soba noodles. It is very veggie friendly and they offer for an extra cost brown rice with your meal. I’ve only eaten here twice, but have enjoyed it thoroughly both times. The crowd is pretty diverse, like Vallarta itself. The service is attentive if a little distracted the night we ate there. The food is straightforward and tasty; even thought they offer very authentic SE Asian dishes none of them are too spicy. Best of all for such an elegant and special evening as you will have when you dine here you won’t break the bank (unless you order expensive wine which in PV is very expensive, usually 3 to 4 times more per bottle then we would pay in NYC). Our dinner for two with 2 beers and a Sake for Neil was around $70 USD. A bargain for what you get. 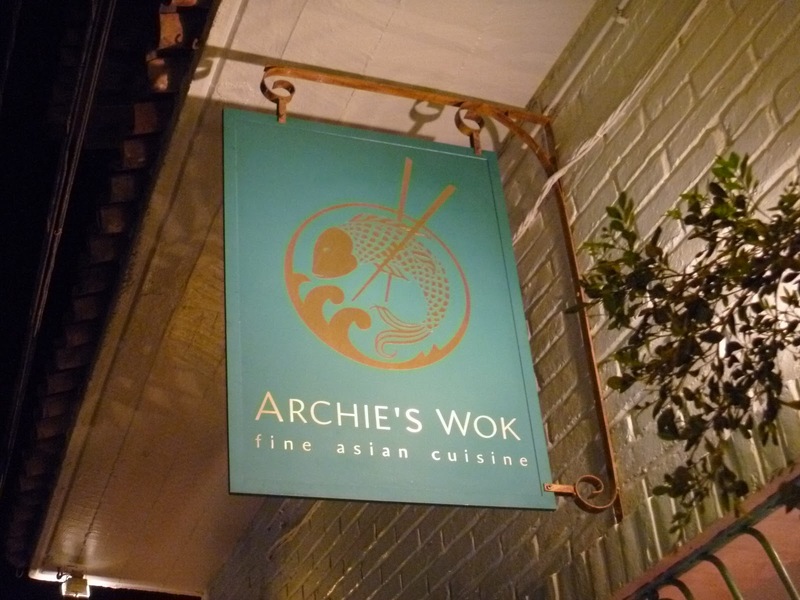 If you are visiting PV, put Archie’s Wok at the top of your dining list. Above is the front of the restaurant from the street. 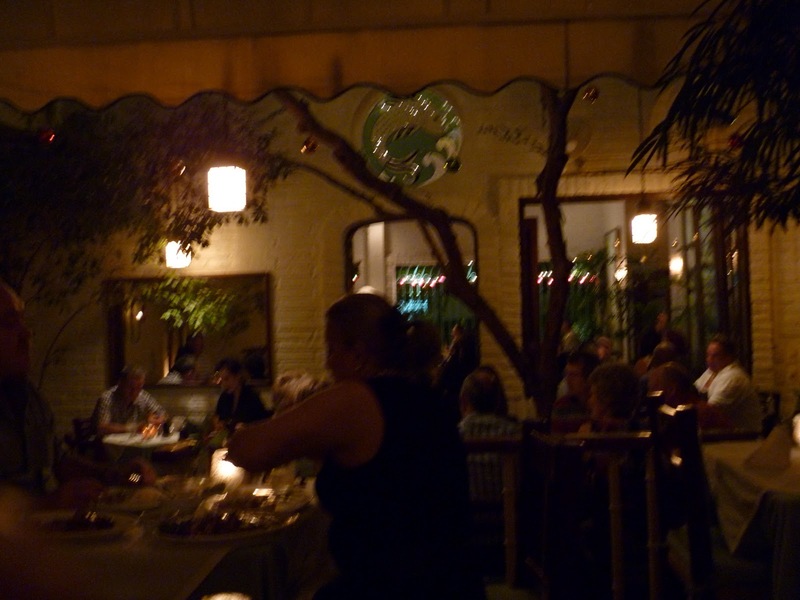 Below is the view from our seat at the back of the restaurant overlooking the beautiful inner courtyard with a tree. It has a very Japanese zen style and a small stage with a beautiful screen at the back which acts as a backdrop for the harpist who plays during dinner most nights. 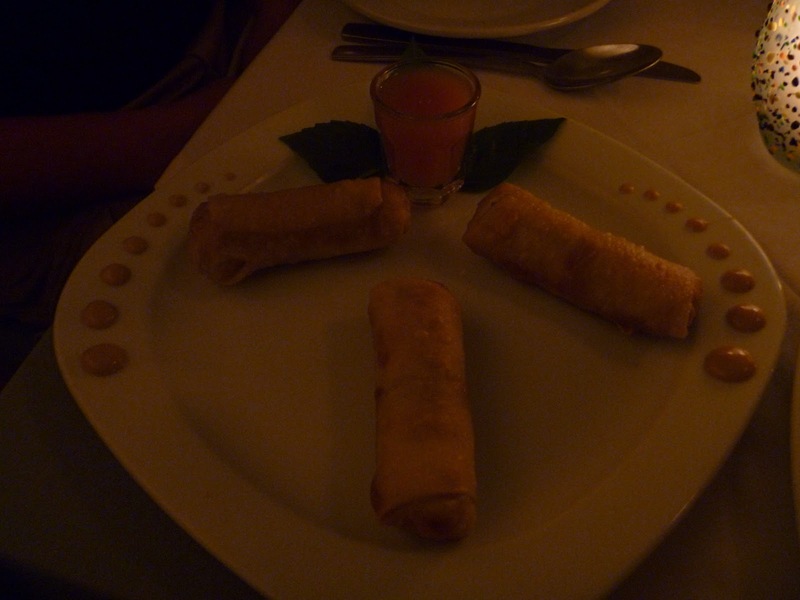 It really was too dark and I loathe flash photo’s, but here is a picture of Neil’s veggie egg rolls. The dots are hot Asian mustard and in the little glass is a very pungent and sour sweet pineapple dipping sauce. 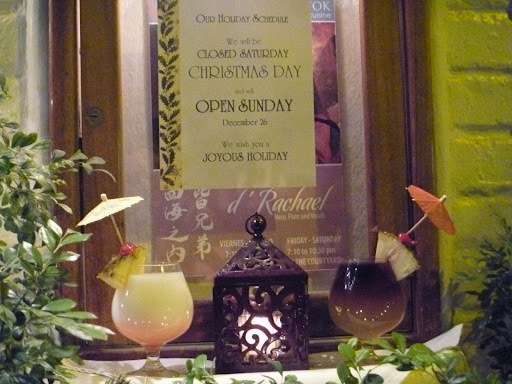 This entry was posted in Travel and tagged Archie's Wok, Mexico, Puerto Vallarta restaurants. Bookmark the permalink.